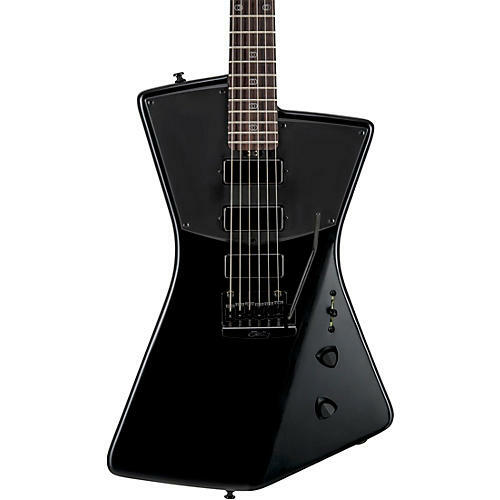 The St. Vincent offers many of the features of the Ernie Ball Music Man model at a more affordable price point. Unique and original in design, yet familiar in a perfect combination of style, balance, versatility and playability. A completely new, refreshing design; as individual and fearless as St. Vincent's music. Featuring a perfectly balanced, bevel-top African Mahogany body, Rock Maple neck and Rosewood fretboard with St. Vincent signature fretboard inlays, this guitar is a stunner on every level. An amazing array of tonal variations are available from the three specially voiced, Ernie Ball Music Man specification mini-humbuckers which are selected by a custom configured 5 way switch. The two-point, bent steel saddle "Vintage Tremolo", oversized Ernie Ball Music Man 4 + 2 headstock providing straight string pull for unrivaled tuning stability, and factory equipped Ernie Ball Slinky strings keep you in tone and in tune. Includes gig bag.